Once you're ready to turn your dream of losing weight into reality, it's time to develop a fitness routine. People who enjoy a repetitive, solo workout can often find success by pedaling an exercise bike. This simple workout contributes to a rapid calorie burn to help you work toward your goal. The recipe for losing weight is to burn more calories than you consume, notes the American Council on Exercise. This process, which entails creating a calorie deficit, is often attainable when you increase the amount you exercise and decrease your caloric intake. Regular workouts on the exercise bike can play a pivotal role in helping you reach a calorie deficit. If you're able to burn an excess of 500 calories per day, or 3,500 calories over the course of the week, you'll lose one pound of fat in a week. The key to using an exercise bike to help you lose weight is to perform your calorie-burning workout frequently. Adults should get a minimum of 150 minutes of moderate-intensity cardio exercise every week. If you're eager to lose weight quickly, a workout that includes at least 300 minutes of weekly cardio can speed up the weight-loss process. Pedaling an exercise bike is an efficient way to burn calories. Visiting the gym five days a week and pedaling an exercise bike for 60 minutes per day can help you work toward creating a calorie deficit. If you're short on time, however, you don't necessarily have to abandon your plan of using the exercise bike. Instead, use the machine for interval training. The ACE notes interval training can take several forms. 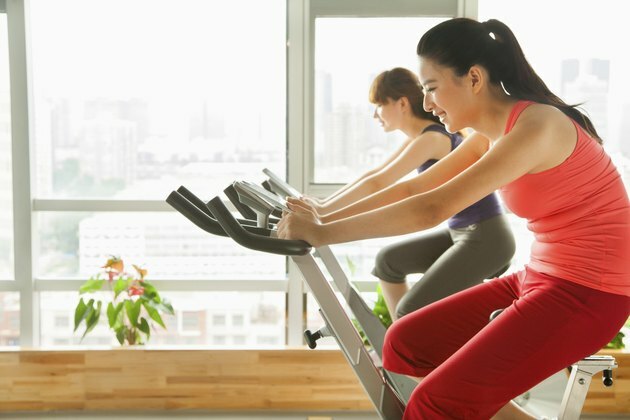 With the exercise bike, an interval-training workout could involve doing 60-second sprints and alternating them with 60 seconds of moderate pedaling over the course of 20 minutes. This type of workout is an effective way to elevate your metabolism to help you burn more calories. Increasing the amount you exercise by frequently using an exercise bike is beneficial, but you're more likely to lose weight by combining exercise with modified diet. National Weight Control Registry data reveals 89 percent of people who successfully lose weight and maintain their post-weight loss body do so through diet and exercise. You can cut your caloric intake in a multitude of ways. A simple strategy is keeping healthy foods, such as vegetables and low-fat proteins, on hand to eat when you're tempted to snack on something unhealthy, for example.